Steve Potuzak explained to his wife, Soi, yesterday how the sound of thunder alerts customers that the produce is about to be automatically misted at the new Safeway store on Kapahulu Avenue. 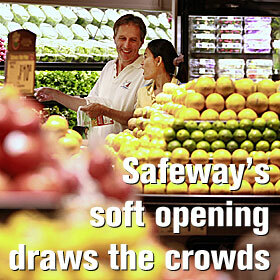 Kapahulu residents got a sneak peek of a new Safeway store that is the largest in Hawaii. But the next-door neighbors at the Holiday Parkway planned to picket the store today at its grand opening.